India is expected to see a surge of green building, with nearly 55 percent of all projects likely pursuing green by 2021, according to a new report from Dodge Data and Analytics. This percentage has nearly doubled since the last report, published in 2015. USGBC was a contributing partner in this report, which shows the continued growth of green building worldwide. Most survey participants from India (90 percent) have had at lease some level of green building experience, and nearly half expect green growth in two sectors: new commercial construction (54 percent) and new high-rise residential (49 percent). Although the percentage of Indian respondents expecting new green commercial construction is on par with the global average, the percentage anticipating doing new high-rise residential is significantly higher than the global average (35 percent). These are the same sectors with the highest expected growth in the 2015 study, indicating consistent growth in new green projects over time. India is behind the global average of participants expecting to do green retrofits, but it is one of the top eight countries where respondents say they use metrics to quantify the benefits of green buildings. 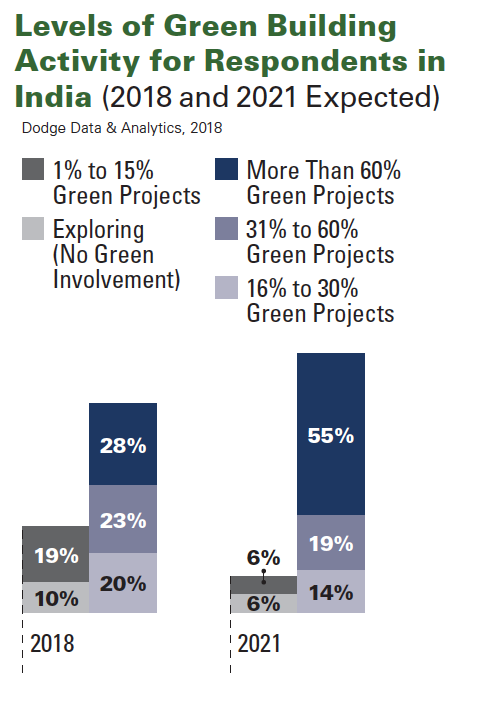 Although only 24 percent of Indian respondents expect to do a green retrofit in the next three years, there remains a large opportunity for Indian green building professionals to accelerate the pace of greening their existing building stock through the use of operational benchmarking tools like LEED v4.1and Arc. While client demands and environmental regulations remain top motivators worldwide, creating healthier buildings emerged as an important trigger for building green. Sixty-three percent of Indian respondents said improved occupant health is the most important benefit of green building. Additionally, respondents from India rated environmental reasons for building green —such as reducing energy and water consumption and protecting resources—very high. The strong emphasis on healthier buildings suggests that market triggers are tied to larger global trends that have cemented health as a top concern. Most Indian respondents rated each of the social reasons for building green higher than the global average, but improving occupant health and well-being and encouraging sustainable business practices emerged as the top two choices overall. When it comes to environmental reasons, the majority of Indian respondents (80 percent) consider all five listed environmental reasons as important, with reducing energy consumption, reducing water consumption and protecting natural resources as the top three motivators. As green building has grown, the savings associated with lowering operating costs continues to be a top benefit for owners. Worldwide, nearly two-thirds of respondents expect to see building operating costs decrease by at least 6 percent within the next 12 months, while more than 80 percent expect this same rate of return in the next five years. Although Indian respondents were more conservative about their expectations for cost savings compared to 2015, the payback period for new and retrofit buildings in India closely aligned with global findings. 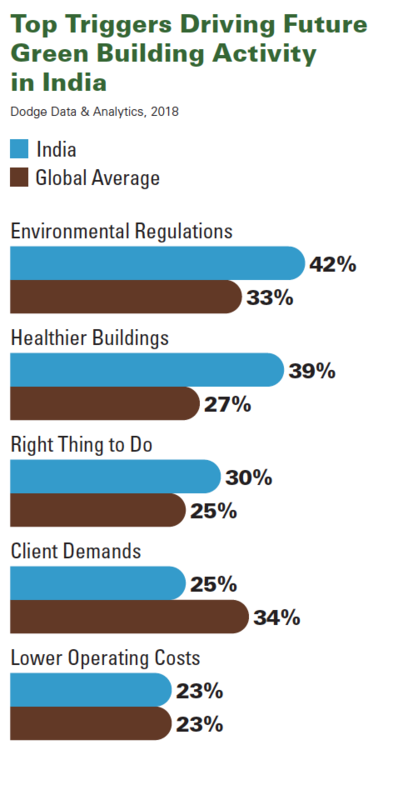 More than half of Indian respondents said that lack of public awareness was a top challenge to green building efforts, a trend that is supported by the relatively low performance of client demand. This suggests the need for greater education of developers and consumers to create higher demand for green buildings. Other challenges includes a lack of trained/educated green building professionals and the limited availability of green products in the Indian market, which go hand in hand with demand generation. Overall, global green building activity continues to rise, with significant increases expected in 19 countries over the next three years. The study was conducted in 86 countries and surveyed 2,000 building professionals, including architects, contractors, consultants, developers, engineering firms and investors.